Michael is a retired professional football referee and a long-standing member of the group, being particularly active as a committee member and vital marketeer for the annual festival and group performances. 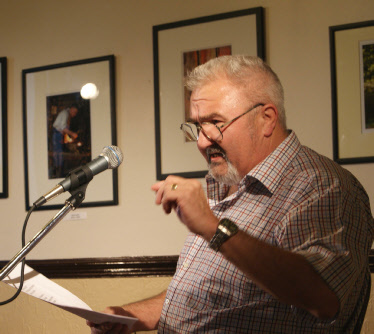 He is photographed here during last summer's 'Lyrical Allsorts' reading to a packed house from his own composition during which he invited the audience to participate at certain points. Mike is married with two children and four grandchildren and his writing interests include poetry, for which he won the group's previous challenge trophy. He also writes short stories and is currently creating his autobiography about the trials and tribulations of a referee.